Cross listing your items on Amazon is a good way to get more people to look at your cards. We are the largest seller of sports and trading cards on Amazon – over 90% of cards listed on Amazon are held in our inventory. Additionally, you can cross list to eBay. We offer the ability to cross list your cards to Amazon and eBay. This can be helpful in getting more eyes on the cards you are looking to sell. First, log into your COMC account. Afterwards you can get to your Profile & Options page by clicking on your username and selecting Profile & Options. 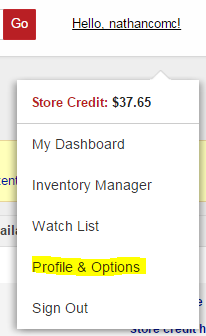 Towards the bottom of the Profile & Options page are the settings to Sell on eBay Amazon. By default, your account will be set to “No – Do not list my items on eBay.com and Amazon.com”. Please note that this setting applies to all of the cards in your COMC account. At this time, we do not have a system in place to select only certain cards to be cross listed. You can select “Yes – I will accept 20% off offers from eBay and Amazon” to turn this syncing on. As an example transaction, let’s say that you have a card with an asking price of $100. If someone were to buy it through eBay or Amazon, you would receive $80 of COMC store credit. Click the red Save Changes button at the bottom of the page to apply this setting.